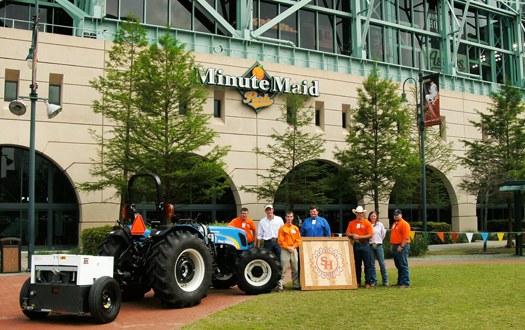 The SHSU biofuels research group with the tractor they displayed Tuesday during the Houston Astros "Play Green" promotion. The Houston Astros are "playing green," and Sam Houston State University's biodiesel research program is in the starting lineup. The Astros gave away free green caps with the Astro star logo at Tuesday night's game, and SHSU students participated in displays relating to their research. "Their field manager wants my group to provide exprtise to convert their equipment to biodiesel," said Doug Kingman, assistant professor and director of the biodiesel research project. "We were invited to display our work, tractor, and students during Tuesday's game. The Astros will do several news releases now and throughout the season highlighting SHSU." One of the first announced "Play Green" efforts to promote environmental awareness was a tree planting and Adopt-A-Block event that included cleaning up a city block near Minute Maid Park. Catcher Brad Ausmus, infielder Mark Loretta, club owner Drayton McLane, general manager Ed Wade and president of business operations Pam Gardner helped plant a tree at Union Station Trail, located blocks from the Astros' downtown home, and "adopted" the block surrounding the trail. The Astros continued the campaign on Tuesday when they hosted the Padres, with Astros players wearing green Astros baseball caps during the game. The first 10,000 fans receivde a canvas eco-friendly tote bag and green cap, both with the Astros Play Green logo. A Play Green expo, consisting of 20 environmentally friendly vendors, was located in Home Run Alley with "Green" information for Astros fans, and the SHSU biodiesel tractor was on display outside the stadium. The team also announced that other aspects of the campaign include the expansion of the ballpark recycling program, conversion of select grounds crew equipment to biodiesel fuel, composting of field grass clippings to use as fertilizer, use of partial post-consumer recycled material for sales collateral and partnering with local Earth-friendly organizations to raise awareness on environmental issues.